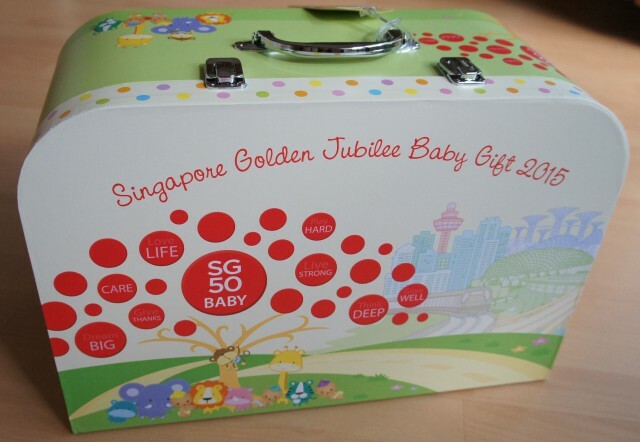 Place your orders for a Golden Jubilee Baby today! P.S. Seriously, Owls Well would like to introduce the newest addition to our family who shall be henceforth referred to on this blog as ‘Thumper’. Both Debs G and Thumper are doing well. Thumper is a very happy baby – and both J and Little E love him to bits! So last week, I wrote about paediatric dental hygiene talk at Expat Kitchen that I was invited to attend by Colgate Singapore. 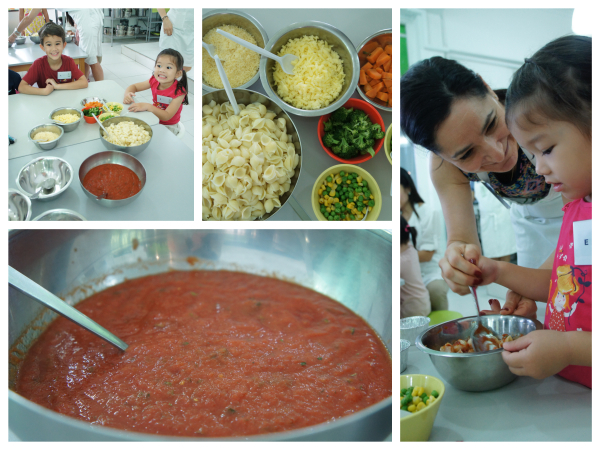 Whilst we were there, the ladies behind Expat Kitchen had us cooking an easy-peasy healthy, low sugar meal together with our children! 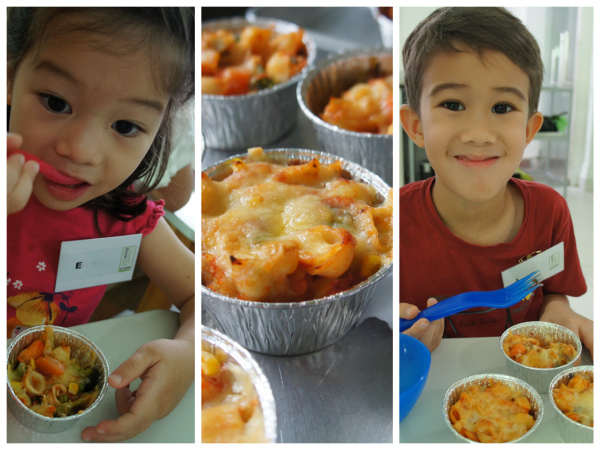 We made a simple pasta-bake for lunch and for dessert, the children assembled their own fruit skewers. Expat Kitchen Pro-tip: Use italian brands of tinned tomatoes as they are naturally less sour and acidic than their american counterparts! Expat Kitchen Pro-tip: Sugar is optional as it is used counter the sour taste of tomatoes! Reduce heat and simmer for 10-15 minutes. Season with salt and pepper. Combine the pasta, sauce, vegetables and cheddar cheese in a bowl and mix thoroughly. 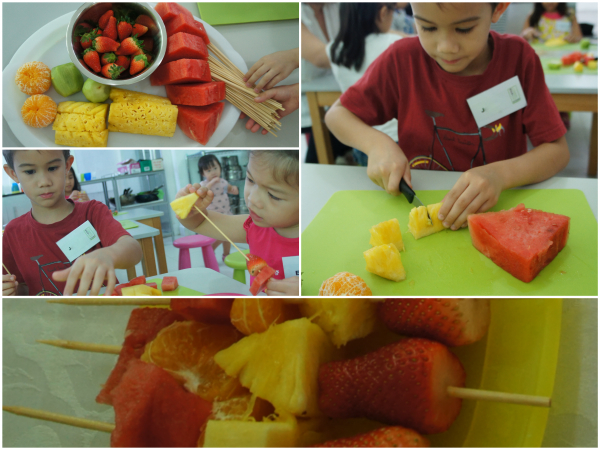 Cut assorted fruits (we used strawberries, coranges, pineapples, watermelon and kiwi) into chunks and slide onto bamboo skewers! Simple and pretty! Last month, I was very fortunate to be invited to a talk on dental hygiene for children at Expat Kitchen given by an ex-classmate of mine who is a specialist in Paediatric Dentistry, Dr Ng JingJing from The Oral Care Centre. This talk was hosted by Colgate Singapore in conjunction with the launch of their new toothpaste, the Colgate Maximum Cavity Protection plus Sugar Acid Neutraliser. Now that J is 7 years old, his baby teeth are dropping out and are being replaced with permanent teeth which he has to learn to look after for the rest of his life…and Little E is becoming more independent with her morning routine (which includes brushing her own teeth). So it’s up to me to teach them how to look after their teeth. I have always wondered if I am doing it right so this dental hygiene workshop was very useful for me. I actually learned a great deal from Jing – she has two kids of her own so she had plenty of practical advice to share and it was enlightening to learn about kid’s oral hygiene from an expert mom! Step 1: Once babies are beginning to wean onto solid food, use a clean, damp washcloth to clean the mouth and massage their gums – this helps them get used to having their mouths cleaned after mealtimes. Step 2: When the first few little teeth start erupting, transition to a baby toothbrush with a very small head and very soft bristles. Use only cooled, boiled water to clean the teeth. Avoid ‘kiddie flavoured toothpaste’. Step 3: Teach your child to spit. Once your child is around 18 months old, get your child to observe you brushing your own teeth and spitting toothpaste out into the sink. Then, clean their teeth with water and a soft bristled toothbrush and get them to try spitting into the sink. They will not yet be able to master spitting at 18 months, but hopefully with practice they should be able to spit effectively around 2-3 years old. Dr JingJing’s Expert Mom Tip #1: Being able to spit is one of the key steps to brushing teeth. This is because swallowing toothpaste containing fluoride is undesirable as this leads to fluorosis which causes discolouration of the teeth. For this reason, Dr Jing advises parents to teach children that toothpaste is medicine, and cautions parents against using ‘kiddie flavoured toothpaste’ which is designed to be more palatable for children, as this encourages children to eat the toothpaste instead of spitting it out. Step 4: Introduce toothpaste as soon as possible (i.e. once your child is attempting to spit into the sink). It is now recommended for children under 2-3 years old to use fluoridated toothpaste as this has been shown to greatly reduce dental caries (i.e. tooth decay). Start by putting a very tiny smear (not a ‘pea sized amount’) of fluoridated toothpaste onto the toothbrush. Once your child is effectively able to spit (usually over 3 years old), increase the amount of toothpaste to a pea-sized amount. Dr JingJing’s Expert Mom Tip #2: Parents should use a very tiny smear or a ‘rice sized amount’ of adult toothpaste for kids under the age of 2 who are not yet proficient at spitting. The mint flavour of the toothpaste tends to be unpalatable for kids and will reinforce the idea that toothpaste is medicine and the child will be more likely to spit the toothpaste out (or dribble it out) into the sink instead of swallowing it! Step 5: Continue to brush your children’s teeth for them until they are around 6-7 years old. This is because a child’s motor skills are generally not good enough to effectively manipulate a toothbrush to properly clean the inner surfaces on the teeth, especially the back teeth in the upper jaw. Dr JingJing’s Expert Mom Tip #3: If your preschooler is becoming more independent, it is okay for them to start learning to brush their own teeth, however, parents should continue to monitor their preschooler’s teeth daily to make sure that they are adequately cleaned, and consider brushing their teeth for them a second time, especially in the evenings before bedtime. 2. Treat dental caries or tooth decay like an infectious disease – because it is! Dental caries is actually the most common transmissible and infectious disease in humans. It is possible to minimise dental caries by adopting habits that minimise the transmission of cariogenic, tooth decay-causing bacteria. Dr JingJing’s Expert Mom Tip #4: Be more paranoid! Teach your kids never to share anything that goes in the mouth. This means no sharing toothbrushes, drinking cups, straws or eating utensils with people outside the immediate family or even with a parent or sibling who has known dental caries or tooth decay. Additionally, parents should not allow people to kiss babies on the mouth as this introduces cariogenic bacteria into an infant’s otherwise ‘sterile’ mouth. Some parents do not worry about caring for baby teeth as these are deciduous and will ‘drop out anyway’. However, it is important to remember that baby teeth act as guides to help permanent teeth to erupt in the correct position. Additionally, teeth are necessary not only to ensure proper nutrition (by being able to chew food properly), but also to help with good speech development. So it does no good for young kids to have their baby teeth removed early as a result of tooth decay. It is also worth noting that the permanent teeth are often present within the gums of children, waiting directly underneath the roots of the baby teeth – which often means that tooth decay in baby teeth can also spread to the unerupted permanent teeth leading to malformation. So it is worth keeping the baby teeth in good condition! Dr JingJing’s Expert Mom Tip #5: When the permanent teeth are erupting, sometimes they start erupting behind the baby teeth instead of directly underneath – when this happens, encourage your child to wiggle the baby tooth loose and remove it as soon as possible. If the permanent tooth completely erupts before the baby tooth drops out, it will stabilise the loose baby tooth and lead to more problems such overcrowding, crooked dentition, even tooth decay as permanent tooth surface cannot be adequately cleaned by brushing – in such cases, visit your dentist to have the baby tooth removed. We all know that sugar is the main culprit behind tooth decay as it is the food on which cariogenic bacteria thrive, making acids that ruin tooth enamel. Parents should be aware that sugar occurs naturally in many foods, but the amount of sugar hidden in processed foods (especially marinades and bottled sauces) beggars belief! 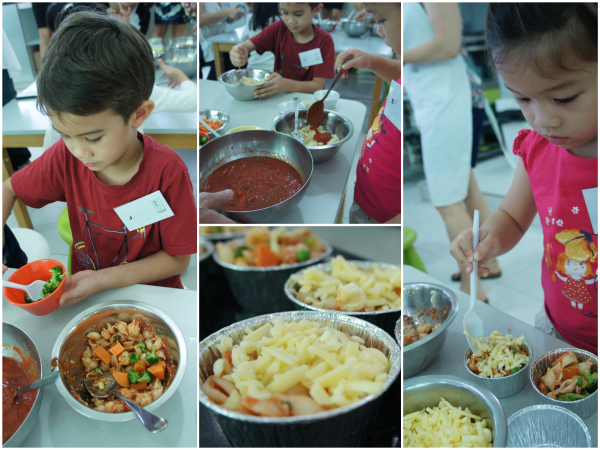 I’ll be sharing a low-sugar recipe from Expat Kitchen later on this week which was SUPER easy to make, the kids actually did it all by themselves. They take a long time to eat during mealtimes. They hold food in their mouth for a long time without chewing or swallowing it (‘food pouching’). They drink milk/juice or nurse to sleep. Despite adequate solid food intake during the day, they breastfeed “on demand” throughout the night (sometimes even nursing constantly for several hours at night). They have many tiny meals/snacks frequently throughout the day, or they drink only juice/cordial or milk, spending several hours sipping them slowly. In these children, their teeth are nearly always in contact with food during the day (and sometimes throughout the night). Even though their diet has been carefully selected by parents to be low in sugar or sugar free, the food is eventually converted into natural sugars by the enzymes present in saliva. Thus, their teeth are constantly sitting in a sugary, acidic environment which leads to decay. 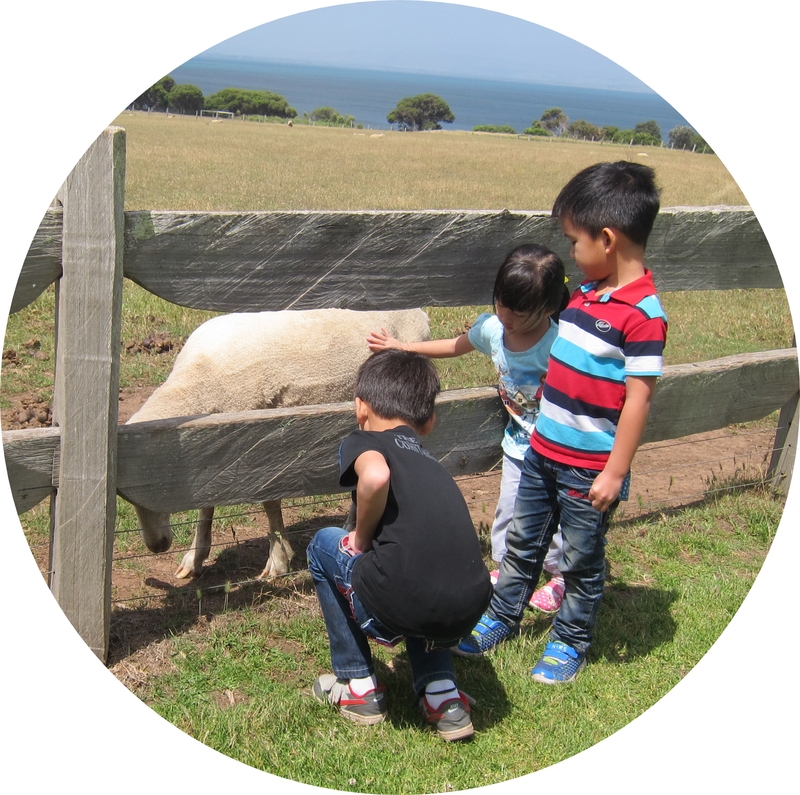 Dr JingJing’s Expert Tip #6: Limit the number of mealtimes to five a day (three main meals and a mid-morning/mid-afternoon snack, or for breastfeeding infants who have teeth it means 3-4 hourly feeds), and limit the length of mealtimes (or nursing time) to 20-30 minutes. During these mealtimes, children can literally have as much sugar-containing food and drinks as parents will allow, but in-between meals, they should only have water. Once your child’s first tooth comes in, you can start bringing your child to visit the dentist for biannual checkups. Teach your child to love the dentist – do not use trips to the dentist as a threat or a punishment for errant behaviour! J and Little E started seeing the dentist for ‘checkups’ waaaaay before they could even walk because we have a Convenient Dentist Uncle in the family. He blows them balloon elephants and chickens out of latex gloves. Dr JingJing’s Expert Mom Tip #7: Primary school going children attending local schools in Singapore actually receive free dental care from their school dental clinic and are entitled to a free checkup every year! Make an appointment on behalf of your child with the school dentist for a checkup midway through the school year, and for the second visit, make an appointment with a friendly dentist of your choice – there are many dental clinics that cater specially to children. P.S. Check out more great tips on dental care over at Life’s Tiny Miracles! Mistress A Becky Lee BA MPA Esq etc. That’s right! After three years of working and studying, I have now gradMAtated! It’s like graduating, but you get a MAsters. Get it? So, I am now A Becky Lee BA, MPA! That’s Mistress A Becky Lee of Professional Accounting to you! All Hail and Onward to the next accreditation! …and onward to the next job too. A note from Debs G: A Becky Lee is too modest to say this, but I have no qualms in giving credit where credit is due! 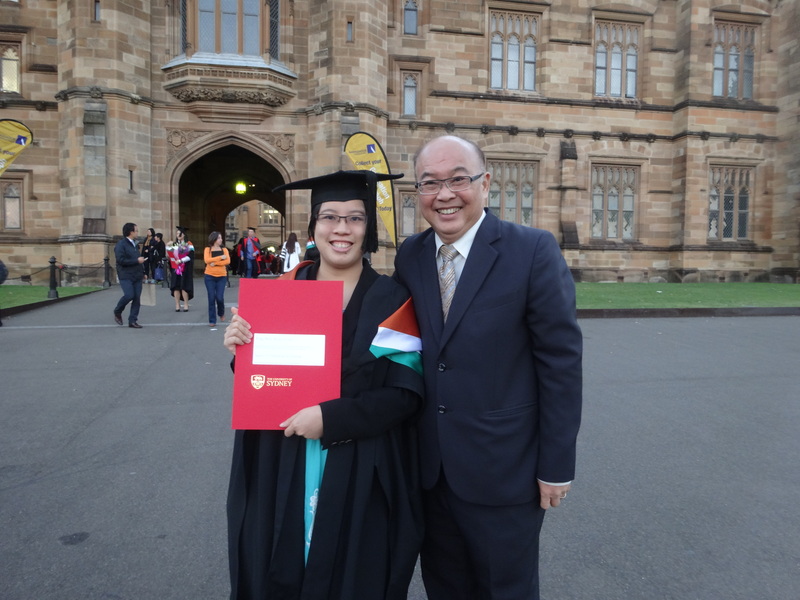 A Becky Lee has been studying for her Masters degree part-time whilst also holding down a full-time job, so it’s been a very tough three years for her trying to juggle everything – so congratuMAlations and celeMAbrations to you, little Sis! We’re all very VERY proud! 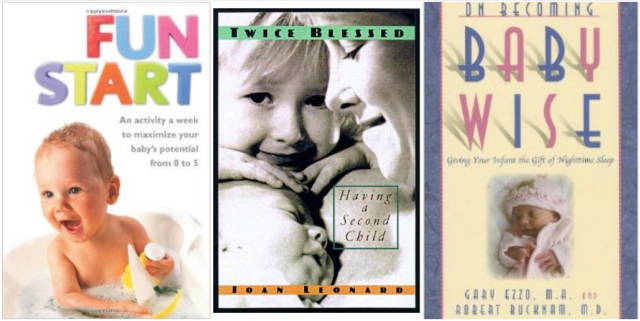 When we were preparing for our first child, we honestly had very little idea of what we needed. We were highly dependant on recommendations from magazines and mothering forums, all of which listed hundreds of baby items that were deemed essential for basic survival. So, we researched and consulted the Oracle of Google and researched some more, and in the end we made lots of good investment buys, but also lots of poor choices which we regretted spending large sums of money on. I remember wishing that there was someone who would have warned me before I put down money on an expensive baby “necessity” that only saw the light of day two or three times! By the way, this list does not include safety equipment like carseats – safety equipment is a NON-OPTIONAL purchase! The only drawback of the travel cot is that it is not very pretty to look at. However, the cot has become very lovely to us by virtue of the fact that it has been indispensable! The travel cot that we purchased cost less than SGD$150 and comes with a bassinet, a changing table that can be perched on top of the cot, as well as a detachable toy bar. It has two wheels to make it easy to move around, and the whole thing folds up umbrella-wise and can be stuffed into a carrier for transport. We love this cot because it is not only very sturdy and can be used until a child is ready to transit to a proper bed, but it is also multifunctional (so we saved a bundle on nursery room furniture). We brought this cot with us whenever we went abroad because we found that having a familiar sleeping area really helps to settle a small child in a strange new place. We also found that the mesh sides of the cot were really wonderful when babies start rolling and crawling around – because we did not have to worry about them bumping their heads or getting limbs caught in the cotsides. No need at all for fussy cot bumpers! WORST BUY #1: The expensive solid wood cot-bed that looked so gorgeous but turned out to be so useless. 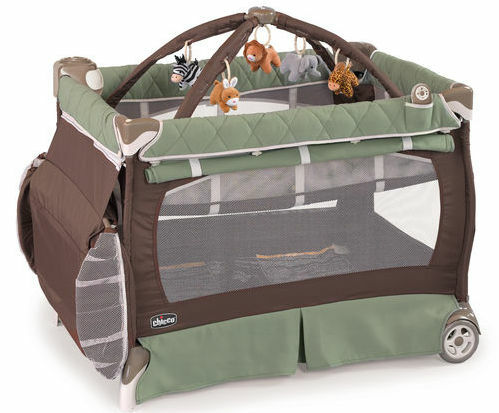 It cost nearly 10 times that of the travel cot and it has been a terrible investment. We had grand ideas of using it as a toddler bed and then as a day bed, but it has since been dismantled because it was taking up so much space in the house and anyway, the babies hated sleeping in it cos they kept knocking into the sides. We have not even got it out for Baby #3! If you’re looking for a great gift for an expectant mom that will come in useful from birth, I highly recommend this inexpensive option! The sarong sling is really useful for babywearing from birth and can be used all the way until the child is 3 years old (or 18kg, whichever is first), and it’s one size fits all, so it fits not only petite frames like mine, but can be used by giants like the Barn Owl (and the Barn Owl’s dad, as you can see from the picture!). It is also pretty to look at, super lightweight, packs well into a diaperbag and is comfortable to wear in warm, humid climates. Additionally, the sling is wonderful for breastfeeding on the go, or for use as a nursing shawl. 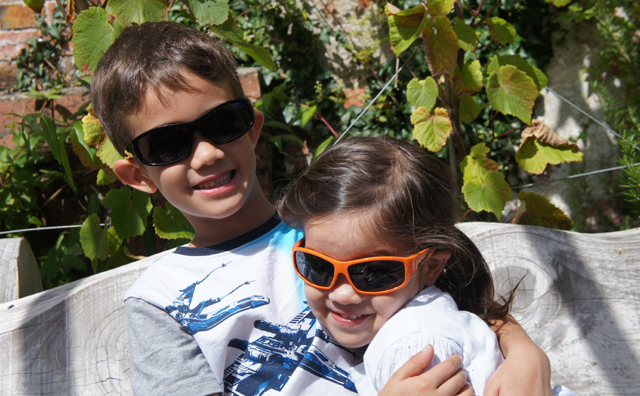 It can also double up as a blanket or sunshade in the car or pram. 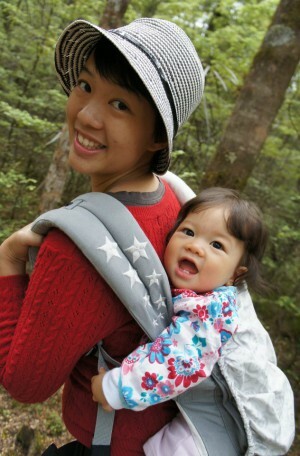 At around SGD$50-60, it is much cheaper than a structured baby carrier as well! 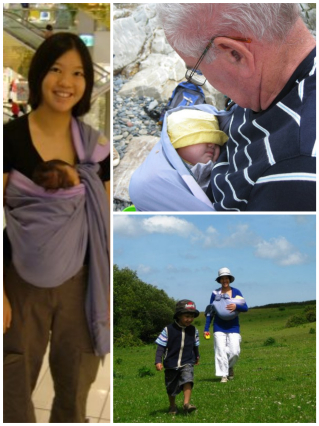 Although the sarong sling is meant to be used until a child reaches around 18kg, I found it much more comfortable to use a structured baby carrier once the babies got too heavy to carry with all their weight on one shoulder. A structured baby carrier is usually designed to distribute a child’s weight across the parent’s shoulders and hips, so that the parent can comfortably carry more weight and maintain a good posture at the same time. 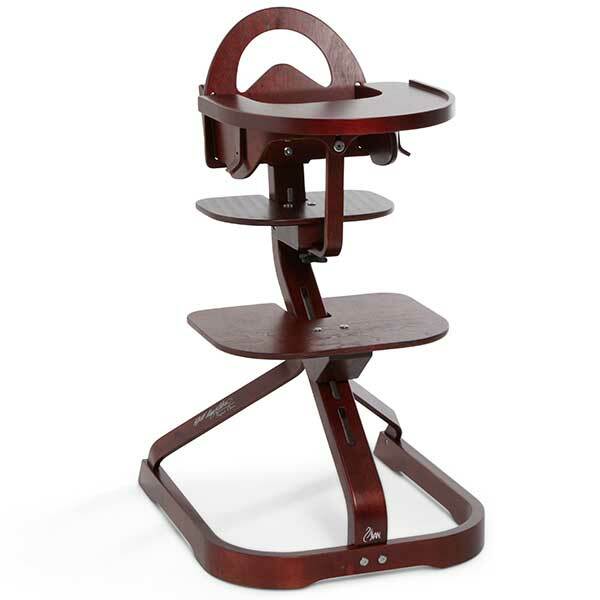 It is comfortable for the child too because they are in a sitting position with a nice straight back, and both J and Little E would take long naps in the carrier. Although it is much bulkier and warmer to wear than a sarong sling, the baby carrier is really useful for getting about solo in the city and for travelling. 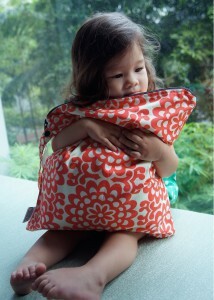 It’s so great for fussy little ones on aeroplanes who just want to be carried! We also brought it along with us during holidays where we were doing lots of hiking and walking. We used the carrier until J was about 3 years old, by which time Little E was big enough to use it – she used it for 3 years as well, and now I’m getting it out again for Baby #3! Worst Buy #2: The very fancy-looking, very expensive Convertible Pram-Stroller that was apple red in colour but turned out to be a white elephant. We bought it because we thought it would be suitable from birth until 6 years old and because it could be adjusted to lay completely flat for naps-on-the-go. However, like all convertible stroller systems, it is large and bulky. In fact, it was so big that it took up most of the space in the car boot. Even though it could be folded up one-handed, it proved to be a hindrance as it just became a huge weight that I would have to lug with one arm (the other being full of baby and baby bags) when going up escalators or getting onto the public bus. It was really heavy so pushing it around was actually more tiring than just carrying a baby in a sling. Additionally, the lay-flat pram function of the stroller turned out to be not very useful as our babies preferred to be carried so that they could look at their surroundings instead of staring straight up at the sky. In the end, the pram became more of a glorified shopping trolley when we went out. We actually gave up using it. We gave it away before Little E was born. 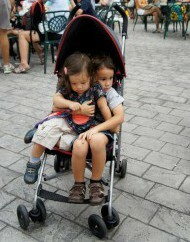 We did get a super-cheap (it cost less than SGD$80), super-lightweight umbrella stroller which we really do love. The umbrella stroller can only really be used from when a child is able to sit up unsupported (so from around 5-6 months of age), but that worked well for us because we were baby wearing during the early months anyway. The umbrella stroller was so much smaller and easier to travel with, so we took it on holiday with us, and if it needed to be folded, it was light enough to hang on the crook of my arm like, well, like an umbrella. It can also be dragged around in its folded position. It is so streamlined so it is easy to get the pram into tight spaces (like crowded restaurants, for example). The only drawback of the umbrella stroller is that it is so lightweight that if you take your child out of it when you still have a heavy diaper bag resting on the handles, the stroller might tip over. The seat can be reclined but it doesn’t lay flat – that won’t stop the kids from taking a nap in the stroller when they are tired! If you have not already noticed, our worst buys so far have been purchases intended to ‘grow with the child’. This rule does not apply to the convertible highchair! We love our convertible highchair because it is not only beautifully made from solid wood and fits in well with the decor of our home, but it is slim so it takes up little room in the house (unlike the bulky plastic highchairs that have such a large footprint). Yes, it is very pricey, but I feel that we have gotten more than our money’s worth out of it. We used it for both J and Little E from when they started sitting up with us at the dining table, adjusting the seat to the right height, until they were big enough to sit in regular dining chairs without needed a boost. Now that the kids aren’t using the chair, I’m currently using it as my computer desk chair – although very soon I’ll have to convert it back to a highchair for Baby #3! Mummy Tip: Craigslist and Gumtree are a great places to find all sorts of preloved baby things in good as new condition! Save money + Recycling = Doubleplusgood! I can never say enough good things about our cloth nappies. They are rather a large investment as cloth diapers cost about SGD$30 apiece at the start, but they have eventually paid for themselves over the last 7 years of use! These lovely, light, 100% cotton muslin cloths are wonderful and inexpensive – and they are so versatile! I always carry one or two of these in my diaper bag when we go out because they are so handy. The best thing about them is they are thin and superfine which makes them easy to launder – if they ever get soiled, you can wash and dry them, and they’ll be ready to go in an hour or two! 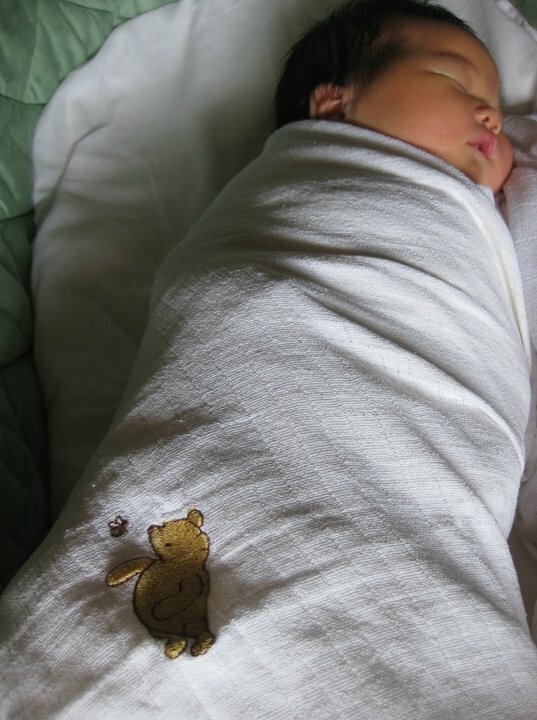 Muslin swaddles come in many different sizes (Malaysian brand Anakku makes a very basic white 10pack of ‘cloth napkins’ which are 76 x 76cm and I’ve seen them sold for under SGD$30 at Fairprice), but my personal preference is for very large muslin cloths measuring at least 100 x 100cm with pretty prints or embroidery! I first purchased a wet bag to accompany my collection of cloth nappies – I mean, I needed a good place to put soiled nappies (or clothes) when we were out and about. Wet bags are not only good for keeping wet and messy items (like soiled clothing or nappies) separated from the rest of the contents of the diaper bag, but they keep nasty smells in very well too. If they ever got dirty, I just chucked them in the washing machine and they would launder up good as new. Once my kids were out of nappies, the wet bags became laundry bags, luggage organisers, swim bags, picnic sacks, and reusable shopping totes (they are especially good for corralling items that collect a lot of condensation). 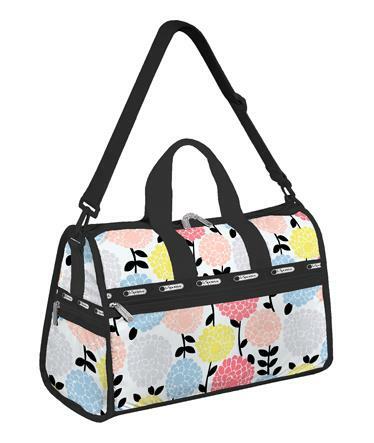 Apart from the changing pad and the insulated food/bottle holders, which are easily purchased separately, a diaper bag is essentially a glorified overnight bag with bells-and-whistles and a hefty price tag. So, instead of a purpose-built diaper-bag, I bought a roomy, washable bag in the ‘Medium Weekender‘ style from LeSportsac during the end-of-season sale at Isetan that had lots of zippers and pockets. It was a fraction of the price of the Le Sportsac baby bag, and I still use it as a carry-on luggage bag when we go travelling. 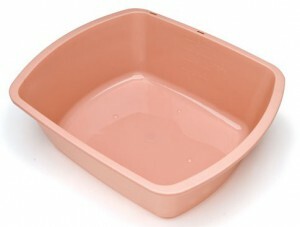 A simple plastic washing up tub, available for less than SGD$10 at any neighbourhood hardware store, makes a decent little baby bathtub. You can fit a tiny infant in there to start with until they are big enough to sit up in it. Thereafter, it can be used for water play in the shower or in the big bathtub. I prefer it because it is small enough so that it can be filled up using the bathroom sink which saves me the trouble of having to carry it from the shower to the bathroom countertop. Even when it is filled with water, it is light enough to carry around without breaking one’s back. Additionally, it is too small to completely submerge a child so I feel that the risk of drowning is much less. Worst Buy #3: A purpose-built Baby Bathtub This was a roomy SGD$80 Fisher-Price baby bathtub that came with a cushiony sling to support newborns. It was HUGE. And when it was filled with water, it was HEAVY. We actually bought the small plastic basin and used it to fill up the larger baby bathtub. Yes, the kids loved splashing around in the baby bathtub, but really, we eventually just started using the small basin as a bathtub, because it saved on water and was easier to use. It has been a while since we’ve had a tiny baby in the house, and I not only need to refresh my own memory but also make sure that both J and Little E know what to expect. Little E is getting tired of the books that we already have in the house pertaining to babies, so this gives us an excuse to take a trip to the local library, which has tons of very good titles about introducing a new baby to the family as well as several useful reference books to help prepare expectant parents. This is a lovely rhyming story about a little boy waiting for his brother or sister to arrive, and he imagines that his mother’s growing belly is a house where the baby is staying! This book is really great for helping kids to understand why their mummy is changing in both appearance and behaviour, especially focussing on symptoms of pregnancy such as feeling tired and sickly (or having bizarre food cravings!). This picture book looks at how life changes for an older sibling once a tiny baby is introduced into the family. It shows what sort of care a newborn baby will receive, as well as the different roles that family members play in the baby’s life. 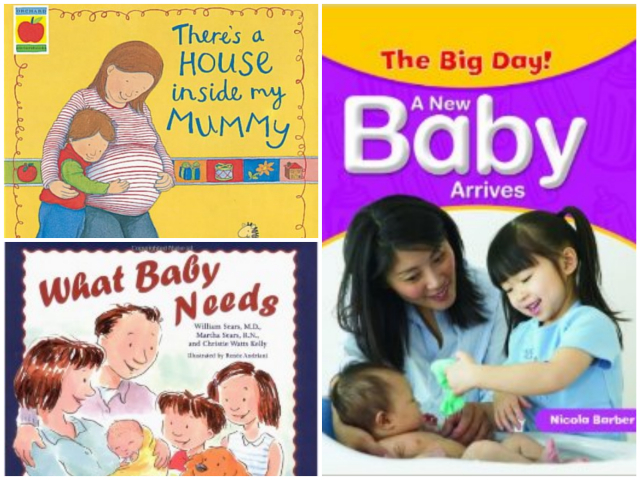 At the beginning of each section there are notes aimed at grownups with useful advice on what sort of information and stories that can be shared with a child to help them to understand what is to come, as well as how to deal with specific issues and worries that children might face when preparing for a new sibling. The detailed illustrations show all sorts of scenes that are associated with attachment parenting, such as baby-wearing in a sling or a carrier (by both parents! ), co-sleeping and breastfeeding, to help kids become familiar with these actions taking place in their own home. A very practical book! I like this particular book because it uses photographs instead of illustrations and thoroughly explores how an older brother and sister might feel when a new baby comes into their life. A very useful book to use as a springboard for discussion with the big brother/sister-to-be about any uncertainty or anxiety that they might be feeling as they anticipate a big life change. This is a great book for troubleshooting babies. Of course, I realise that the methods used in ‘Babywise’ are controversial, but I actually found the concept of parent-led schedules very useful. The book itself is a good guide on how to manage the early days of infancy, from breastfeeding to sleeping, and it helped me gain confidence in myself as a parent. I found that the book helped me develop my own framework on how to organise my day and how to fit a new baby’s routine into an already existent, fixed schedule. The very practical advice in the book helped me greatly, especially during those early sleep-deprived days when common sense and logical thinking goes out the window! I found this book extremely useful when preparing for a second (and third!) child. The author of the book is brutally honest about the impact that second children have on a family, and deals with many issues surrounding second children, including sibling rivalry. It really helped me to think through how I would prepare my first child for the arrival of a younger sibling. This book is a collection of weekly games which are matched to a child’s age and development from birth to 5 years old. It gives you a great idea on what kind of interaction to expect from your child at different stages in his or her development, and has plenty of fun, simple activities that you can do with your growing child every week. All the activities are really short and simple, and they mostly involve common household objects, so they are easy to carry out. I loved finding new ways to play with my kids, so this was a really enjoyable and useful read for me!